A gothic bedroom design can be highly sophisticated when you pay close attention to detail. It's the small touches that give this design style a feeling of authenticity. The details begin with the basic elements you want to include in your bedroom design. Before you begin making purchases, take time to think about all the elements and designs you want to incorporate into your gothic bedroom. Don't think about budget at this point. This is the planning stage so include every item you ever wanted to have in your ideal gothic bedroom. Make a list. Two factors will determine what you end up with from your list - space and budget. If your budget is limited, make a long-term plan so you can buy pieces to go into your design over time. If budget isn't an issue, but you're limited by space, then you must decide what pieces are "must haves." Once you have an idea of the layout you want and the pieces you need to purchase, you're ready to consider the design aspect of your room. Main color Gray, with accent colors purple and black. Main color Gray, with accent colors red and black. Main color Red, with accent colors gray and black. Main color Red, with accent colors black and white. Main color Red, with accent colors black and gold. Main color Green, with accent colors purple and black. Main color Green, with accent colors gray and black. Main color Purple, with accent colors green and black. Main color Pink, with accent colors black and white. Main color Brown, with accent colors yellow and orange. Main color Brown, with accent colors blue and black. Main color Blue, with accent colors black and tan. Main color Blue, with accent colors yellow and black. Main color White, with accent colors black and red (or other color). The two largest surfaces in your bedroom are the floors and walls. In gothic design, the floors are always a hard surface such as stone or tile. You can also use wood floors, but they should be a dark stain. If you want to add a special touch, opt for a distressed floor look with a reclaimed wood floor. Stucco walls lend authenticity to this time period. Stone walls resemble castle walls. Try your hand at painting a faux stone wall or use a faux rock panel. Wallpaper in a Fleur de lis pattern can be used throughout or as an accent wall. Wood boxed-paneling was used on the walls in deep rich stains. Stone floors in castles would carry some radiant heat from the fireplaces or soak up the heat from the sun during the day, but they were still less than desirable to walk on barefooted at night. Animal skin rugs were often used. In the 1300s, Aubusson rugs (thick carved wool) were introduced. 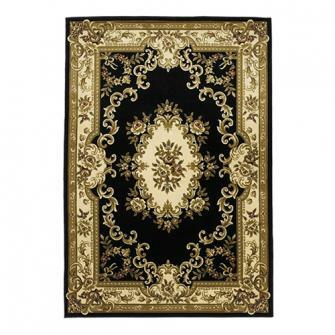 These rugs have a sculpted look and can provide additional insulation for the floor. Choose rugs that go well with your wall color. eSaleRugs: Feature all kinds of Aubusson rugs, including octagon and square shapes. Touch of Class: Offers Aubusson rugs in all shapes and colors combinations. Overstock: Find some great deal on Aubusson rugs with lots of styles and colors to choose from. Lighting is one of your best tools for creating just the right ambiance for a gothic room design. Place an overhead chandelier on a dimmer switch so you can control the light in your bedroom. Dim or low lighting sets the mood for Gothic décors. Table lamps: Choose a 3-way feature for a pair of table lamps for your nightstands. Wall sconces: A wall sconce held a torch, but you can use either a candle wall sconce or an electric one. Chandelier: Change out your overhead light for a John Richard chandelier. Hanging candle holders: Recreate authentic gothic lighting with hanging or pedestal candle holders. Floor lamps: A gothic floor gives needed light and superb ambiance. Tactile pleasure is a must for any true Gothic décor. This can be achieved through the fabrics you choose. Velvets were cherished. Damasks and brocades were other luxury fabrics used. Heavy materials that could withstand harsh living conditions were more than utilitarian. Great tapestry designs were woven into fabrics used for draperies, upholstery and bedding. There are so many bedding ensembles available that include bed sheets, comforter, shams and decorative pillows. Find something that carries the color scheme of your room. You may want to mix and match to create your own special bedding or use your favorite fabrics to have a custom made ensemble. Horchow: Find luxury bedding options that are true opulence. Design Nashville: Most of the bedding offered is custom made. This is a more expensive route, but it ensures you end up with exactly the type of bedding you want. Pillows: Shams, throw pillows, decorative pillows and neck rolls can be layered onto the bed to create a dramatic bed. The same fabrics used for the bedding may also be used for draperies or you may prefer to choose one color from a pattern you've used in the room. Buildings -especially castles- were drafty, so heavy velvet draperies with tassel-fringed valances helped to keep the cold out of bedrooms. A jacquard fabric or Fleur de lis pattern also provides an excellent drapery choice. Half Priced Drapes: If you can't find it here, you probably can't find it anywhere. There are nearly endless choices in fabrics, styles and colors at reduced prices. 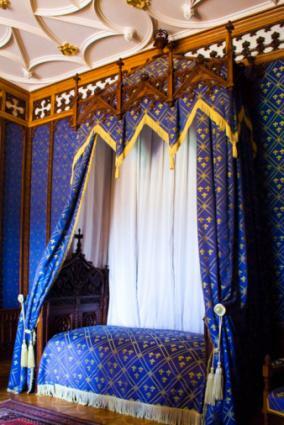 Beds and other furniture during the Gothic period were made from solid wood and therefore were very heavy in weight. Oak was a common tree and used most often. The finish was medium to very dark like most of the wood used during this time period. Iron was one of the most durable metals and was used for all types of décor including beds, furniture brads, hinges on furniture and doors. Arm chairs: Wooden and upholstered armchairs are ideal choices for your sitting area. Armoire: A Gothic Revival armoire is a perfect choice for your bedroom. 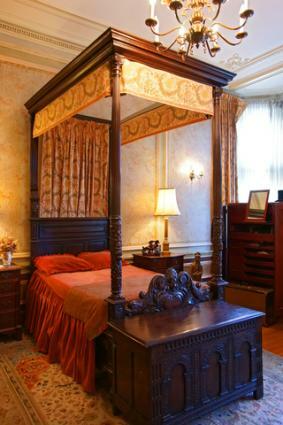 Bed: Hand-carved mahogany bed makes a gothic statement. Gothic arched side chair: Use a side chair at a desk or in a small space near the door. Occasional tables: Use these for the sitting area or larger ones for nightstands. Wrought Iron Bed: Wrought Iron is an excellent gothic metal, especially for a bed. Tudor: Features include archways, stucco, woodwork, boxed paneling, overhead beams, stained glass, stone and masonry walls and floors as well as wood floors. Mediterranean: Stucco, columns, archways, masonry and stone floors and carved woodwork. Arts and Crafts: Stucco, boxed paneling, exposed beams, hand-carved woodwork, stained glass, stonework and wood floors. Gothic arched doorways and windows: Instead of being curved, the gothic arch is pointed. Candle Jewelry: Add a jeweled cross pin to your candles. Tapestries: Suspend a tapestry on your bedroom wall. Metalwork: Use metal artgrids, crosses and other wall art. Stained glass: Either replace a window or suspended a stained glass artwork over the existing window. Tall screens: A tall room divider creates a dressing area or corner vignette. Mirrors: Beveled wall mirrors or large floor mirrors are great choices. Gothic themed bedrooms don't have to be dark and dreary. You can use your favorite color and find pieces of furniture and accent pieces to give it your personal flair. Avoid using modern or contemporary pieces of furniture. Stick to all things gothic and you'll end up with the gothic bedroom of your dreams.